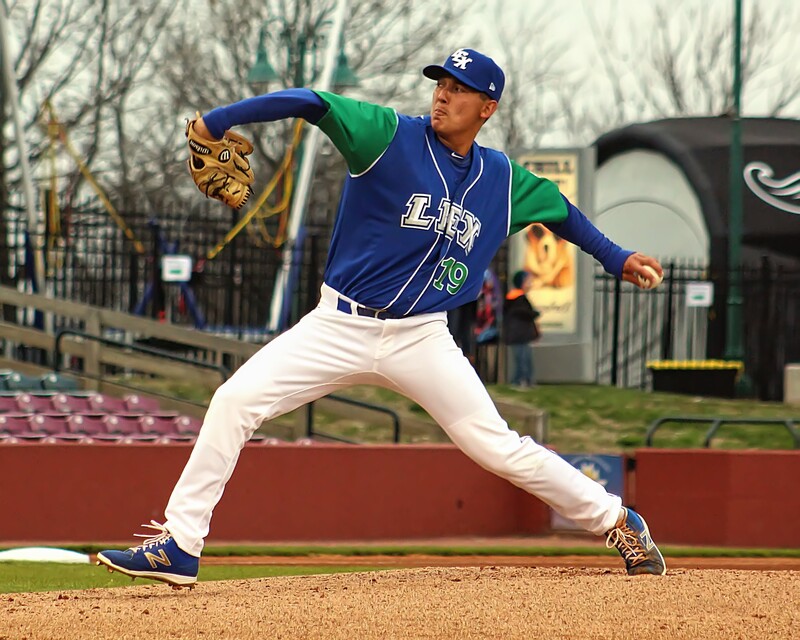 Aside from all the talent at various positions in Lexington, there are a number of worthy prospects on the pitching staff that deserve your attention. We’ll start with a sleeper out of the 2015 Draft. I’ve seen a lot of Davila, both this season and in 2017, and the more I see of him, the more he intrigues me. There are a few reasons for that. First off, Davila was a 4th-round pick out of South Point HS (Belmont, NC) in 2015, and at the time he was ranked 20th nationally among lefties and 3rd in North Carolina by Perfect Game. He was then working with an upper-80s fastball, a slurvy breaking ball, and a changeup that showed good fade and sink. Davila now sits around 90-92, working in a curve at 76-79 with two-plane movement, and a circle-change at 83-84 that shows potential as a plus pitch. He demonstrates excellent arm speed and feel for the change, and has been able to lean on it as a secondary offering if his curve abandons him. Second, it’s important to note that six of those 15 homers allowed came in a two-game span (June 24th at home vs. Columbia; June 30th at home vs. Asheville), in which he allowed three homers in each game. Take those away, and his ERA drops around half a point. Also, while those homers drove up his OPS over the last month (.879 in previous four starts), he’s allowed only a .191 BA against in that same span. Oddly enough, his OBP vs. LHB is 84 points higher than vs. righties (.370 vs. LHB; .286 vs. RHB). He’s put up some of his best numbers with runners on base (.186 BA, .605 OPS w/runners on). Third, while he has shown fly-ball tendencies this season, he has the tools to induce grounders when he’s at his best. In the four games in which he’s allowed 10 or more fly-balls, he has given up two or fewer runs (24 total IP, 7 runs allowed, 4 HRA), so even when opposing batters are putting the ball in the air with regularity, he’s mitigated the damage. A refined curve and more consistency with his change-up, and he could turn the corner. Yes, the HR/FB% is exceedingly high (19.5%), but again, much of that is due to a homer-happy June (8 HRA in 17 1/3 IP). He sometimes drops his arm a bit/dips his left shoulder in his drive to the plate, and that could leave him up in the zone from time to time. Davila has time on his side; he’s only 21 years old, and it’s understandable that a high-school pitcher might have a bit of a learning curve going into pro ball without the benefit of college experience. He has handled himself well on the mound, and typically seems to be unfazed by bad games. Long-term, I could see him becoming a 4th or 5th starter, and his floor would likely be as an effective middle reliever and potential spot starter, assuming he maintains his three-pitch arsenal into the high levels of the minors. Davila was reported to be throwing in the mid-nineties during his senior year, before the Royals gave him the summer off to work out and give his arm a rest. There’s reason to believe that he may yet add 1-2 MPH to his avg fastball. If he can do so, then at his peak KC might have a lefty who sits around 93 and deals a curve and change that are both at least ML-average.